The quality of facilities at one-room schools varied with local economic conditions, but generally, the number of children at each grade level would vary with local populations. Most buildings were of simple frame construction, some with the school bell on a cupola. In the Midwest, sod construction was also used, as well as stone in areas such as portions of the southwest where trees were scarce. In some locations, the schoolhouse was painted red, but most seem to have been white. Mission Ridge School was one of the early schools in Mason County, West Virginia. It has been moved to the West Virginia State Farm Museum complex near Point Pleasant. Examination of the materials in this building indicates that boards and timbers were hand-sawed and also hand-planed. Square nails were used throughout the building. Except for the roof and a few boards in the floor, all of the material in this building is original. Theblackboard really is a black board, made of wide boards painted black. It was not until much later that slate was used for chalkboards, although students often had individual slates for writing practice. The school house was the center and focus for thousands of rural communities, hamlets and small towns. Often, town meetings and picnics were also held there. 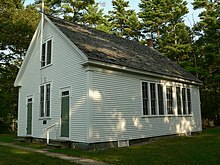 The final operating one-room school in New York State is located in Sagaponack, New York. Nearby Wainscott, New York was located in various one-room buildings until an annex was built in 2008.